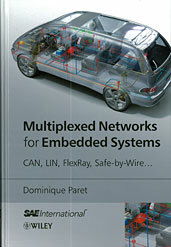 The SAE has published the 434-page book „Multiplexed networks for embedded systems: CAN, LIN, FlexRay, Safe-by-Wire“. The book provides an introduction to automotive multiplexed network buses, covering the technical principles, components, implementation issues, and applications of numerous systems. The book covers CAN, LIN, TTCAN, Flexray, X-by-wire, Fail-safe-system basis chip (SBC), Safe-by-wire, I2C, and MOST networks. According to the SAE, the book will be a valuable reference for engineers and researchers developing electronics, as well as anyone interested in the application of network technologies.